Monell’s offers a unique dining experience, called Family Style Dining. The name says it all, really. It’s almost like a buffet, but the buffet comes to your table instead of you going to the buffet. The concept is that they fill the tables, no matter how many people are in your party. If there are 5 people in your party but the table holds 10 people, then most likely they’re going to seat another party of 4 or 5 at your table for you to share the meal. The kitchen prepares several main dishes, sides and desserts every day and brings it straight to your table to share. Every day they serve homemade biscuits and fried chicken. The other dishes rotate, depending on what day of the week it is. There’s no ordering involved at Monell’s, other than deciding what you want to drink. Monell’s has been around since 1880 and now has 4 locations in the Nashville area. The Germantown location was the only location open for a long time. Over the years, they have branched out to Gallatin and to the Manor in the Donelson/airport area, as well as adding Cafe Monell’s in Berry Hill. It truly is a unique southern, home cooking experience that the locals love for themselves and sharing with out of town guests. It’s a great way to dine with people you probably wouldn’t normally connect with when dining in a regular establishment. 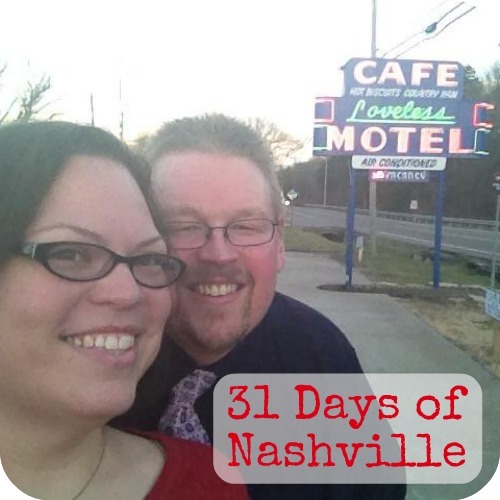 This post is part of a series I am writing, 31 Days of Nashville, where I am introducing several awesome places that make Nashville a great place to live and visit. Each day of the week has a different theme, and I am trying to focus on those hidden gems that aren’t as well known but just as worthy. The Loveless Cafe is another one of those timeless favorites that both tourists and residents of Nashville enjoy visiting. It’s a bit off the beaten path and outside of Nashville proper, but we still claim it as one of Nashville’s treasured restaurants. The sign says it’s a Cafe and Motel, but the rooms haven’t been open for guests since 1985. The Cafe has quite an interesting history, going back to the 1950’s, and the biscuit recipe has been carried along since then. The biscuits are among the best you’ll ever have, along with the country ham and pancakes. Just like most breakfast venues that draw tourists, the weekends usually involve quite a wait to get a table, but during the week it’s much more quiet. The last few years have seen the area expand to include shops to buy jams, jellies, country ham and other food products. The Loveless Barn is also home to live music, with a public television and radio-broadcasted concert series held every Wednesday. David and I celebrated this year’s Pancake Day at The Loveless with red velvet pancakes and bacon. If you’ve never been to the Loveless, you should add it to your list of places to visit in Nashville for some good southern cooking. 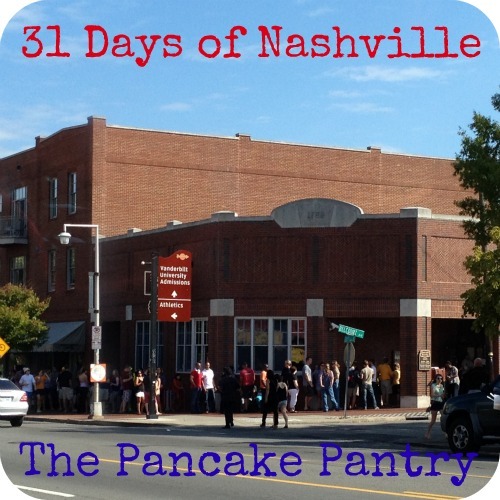 The Pancake Pantry is among one of the top tourist favorites in Nashville. When out of town guests come to Nashville, they often ask about breakfast at the pantry. Because of its popularity with the tourists, there’s usually a line out the door most weekends starting about 7am, even when the weather isn’t so great. One of the oldest memories I have of The Pancake Pantry is my mom telling me about Reba McEntire’s video Is There Life Out There being filmed there in 1991. My mom worked across the street (where I worked years later), and told us how they were looking for extras to be in the video. Extras had to agree to stay there all day and eat pancakes while Reba portrayed a waitress at the restaurant for the video. I may love pancakes, but I don’t know that I could eat them all day. How about you? The Pancake Pantry also has significance with David and me because it’s part of the story of how we met. Years and years ago before the world was made smaller by the internet, I was still fairly new to what is now known as blogging. I had an account on LiveJournal where it was rare to meet people who lived near you. I was searching through journals of people in Nashville, when I came across a post of this guy writing about the pantry, which was across the street from where I was working at the time, and just a block down the street from where he was working. We became friends on LiveJournal then a few months later we met for lunch…at The Pancake Pantry. When we met in 2003, I was married to my first husband, but after my divorce in 2008, David was the guy friend giving me dating advice. A few months later, we started dating, and the rest, you could say, is history. Since we started dating, we celebrate Pancake Day every year on February 11th, which is the date that David wrote the post that prompted us to meet, become friends, start dating and eventually marry. I even wrote pancakes into my wedding vows to David, so we’re pretty much some crazy pancake fans. The Pancake Pantry is only open through lunch, and closes at 3pm during the week and 4pm on the weekends. The best time to go is when the doors open at 6am, unless you don’t mind standing in line for a table. Have you been to The Pancake Pantry? What’s your favorite? I’m a fan of the sweet potato pancakes.